Japanese airlines aren't reassured by the statements of top U.S. aviation officials, especially with another Dreamliner incident reported in Japan. Both ANA and Japan Airlines have temporarily grounded their Boeing 787s. Now the National Transportation Safety Board is sending an investigator to Japan expanding its own probe into Dreamliner safety issues. On Wednesday morning, an ANA flight from Yamaguchi in Western Japan took off for Tokyo's Haneda Airport and about 30 minutes later, the pilots reported smoke in the cockpit and made an emergency landing at Takamatsu Airport. So far all signs point to another case of battery fire. According to my man in Japan, Takeo Aizawa, the Japanese language newspaper, Sankei is quoting ANA vice president Osamu Shinobe saying, "this incident comes from the fact that the batteries of the two cases are the same." Cracked windshields and leaking fuel lines ain't fun, but it's an entirely different safety level when the problem is being generated from an energy source. This can not be dismissed as ordinary "teething problems" on a new model airliner and that's not just my opinion, Mr. Shinobe told reporters the same thing. Mr. Aizawa's translation paraphrases Mr. Shinobe saying that new airliners experience a period of troubles and adjustments, but this is not one of them. The Dreamliner uses powerful lithium ion batteries that are prone to overheating unless handled with extreme care. Further, a former Dreamliner designer explained to me that the coolant used in the power panels can itself become problematic in cases of leaking. 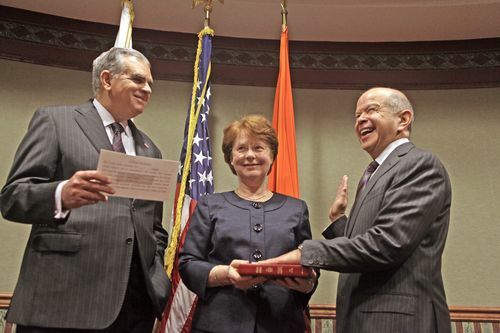 LaHood (left) at Huerta's swearing in last week. It was a battery fire in a JAL Dreamliner in Boston last week that prompted the big dog and pony show January 11, with U.S. Transportation Secretary Ray LaHood saying, and I quote, "These planes are safe." Well maybe they are and maybe they aren't, but considering the nature of the incident in Boston last week and the criticality of the electronics on an airplane that is inherently aerodynamically unstable it was wrong to make an expression of confidence in a plane you've just ordered to undergo a wholesale review from design to production to manufacturing. Last week, I suggested that LaHood, Michael Huerta and Boeing's Ray Conner were spooled up to endorse the airplane regardless of its recent troubles. But for the Japanese operators of the Dreamliner who together are operating half of the 787s flying, the spin cycle is over. Hi Christine, could you give more information on the bit about the plane being inherently aerodynamically unstable. I've not come across this information anywhere that i read about the 787. How fortunate that a diversion airport was near enough. If this had occurred on a long overwater segment we might be following a SAR operation. Inherently aerodynamically unstable may a context issue. This is a fly-by-wire aircraft so the "traditional" longitudinal,lateral-directional, etc., flying qualities are a "model" within the flight control computer. And, no one has commented on whether the aircraft have had any third party installations or maintenance since delivery. It does raise a question about the Instructions for Continued Airworthiness (14CFR §25 App. H). I'm appalled at the number and frequency of these events. My bias must be made clear -- I'm a Pan Am brat and my most favorite plane ever was the 707, so Boeing is up there in the pantheon of giants in my book while Airbus scrabbles in the dirt -- but all seriousness aside, this plane just simply should not be flying. I also hate to be one of those "What's it gonna take"-types who wring their hands over "overblown" incidents that the press love so much, but quite frankly, this is ridiculous. The number and seriousness of the incidents that have been coming thick and fast just make me wanna say "Stop!" and Look Around Ya. Thank bejesus no one has been harmed so far, but the shudders that go up and down my spine when I imagine another JAL 123 happening to the poor beleaguered Japanese, who seem to have been made the crash-test-dummies for Boeing's rollout -- well, in my opinion, each and every passenger and crew should be awarded framed certificates officially deeming them Test Pilots. Forget the A380 Singapore engine blowout, which was harrowing enough; the simple POTENTIAL for what could have been the end for any one of these "incidents" is simply to horrible to put into words. Boeing should do the right thing and give all these suffering test-flight companies a big fat refund, take all their planes back and fly them 10,000 ways to Sunday with hazard-paid test pilots on board and NO ONE ELSE for another five years, with multiple resignations and ritual stomach cutting for having subjected so many of the unwitting public to these cruel experiments -- imagine being taken out, a blindfold being put on you, the sound of several rifles being cocked and then the sound of mighty guffaws as you realise it's all been a trick if you want to put yourself truly into the minds of these poor passengers (and crew!!!) with what they have been forced to go through. I hate to see a bad word about Boeing anywhere but in this case, the entire board of directors should be stripped and whipped and then dismissed and all of these planes should be taken back to the test fields where they belong for at least another 10,000 incident-free flight cycles apiece. In flying about 250,000 miles per year since the late 1960s, I have been involved in 10 full scale emergency landings. This means, engine failure on take off, engine failures in flight, parts of the wheel assembly falling off, windshield cracks, and so forth. That does not count the times we went off the end of the runway, the unpleasant slides sideways down the runway on ice, or the occasional issues noted by warning lights- gear not down and locked etc. Nor does it consider the effect upon cognitive ability that results from 2 helicopter crashes. But the problems with this plane seem to be very similar to another plane called the DC 10. Of all of my emergency landings - 8 of them were in a poorly designed plane called the D C 10. Even with all of that experience, The D C 10 was my favorite airplane. But in my view, the problems with this new plane is that it was assembled all over the world in parts and pieces. This may be ok for cars and manufacturing processes which are tested and tried, but here you are dealing with a change in shall we say modes- carbon fiber and a movement to further worship of green batteries. I think the plane should be grounded forever. I am not ever going to get on one. The plane should go into special exhibits at each international airport in the world. It should be called a monument to outsourcing. The change in modes on this plane is very much like the transition from steam to diesel power locomotives, although I could argue, based upon failure and repair rates, it might just be the other way around. The labor component cost saving on this plane through outsourcing now seems like a fools bargain. That's because it is. The DC-10, the 747, and of course the Comet. They all had "teething problems," a few of them deadly. I was giving the 787 benefit of the doubt, but this latest incident pushes things over the line. In my opinion, JAL and ANA have done the right thing in grounding their fleets, and others should follow. Christine, your sources might want to dig into a fire that occurred in 2006 at Arizona based Securaplane: testing the 787 battery charging hardware they supply to Boeing, the company lost an engineering facility and at least one employee who has since filed whistleblower lawsuits still suffers grave complications from exposure to toxins released. If other carriers continue to fly the 787, they assume liability for the long term health of passengers who get exposed to the smoke from an onboard battery emergency-assuming the cre will be lucky enough to get down safely. Thanks for your superb work on behalf of aviation and oublic safety-you make a difference and I salute your efforts. The FAA certification has in some regard become a farce. The certification effort is now delegated to the company itself. Yes Boeing is now reponsible for their own approval. Unfavorable opinions can get you replaced. Let's be serious here, everyone. The B-787 has been in airline service now for about 15 months. I has had several incidents, but only a handful could be called serious. The 2 vented fuel incidents occured only on one airplane, the cracked windshield was more routine than most people understand. But only a few of the electrical problems seem to be related to each other. 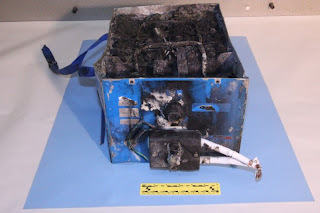 The JL APU battery fire happened while the battery was in use (dischraging), it did not swell but caught fire. The NH battery overheat happened when it was being charged. It selled and leaked. They are not related to each other. The only common denominator was the battery itself. These events, and the other electrical events indicate failure of individual components within the system. This could indicate a QA problem with the subcontractors in the B-787 production program, early produced parts not being up to par. Boeing has already identified a batch of batteries that seem to meet this criteria. But the problem is if Boeing were to replace the Li-Ion batteries with older and more reliable Ni-Cad batteries, and reprogrammed the charging and electrical systems it may only solve the battery situation, and not other electrical component problems, if any. BTW, the Li-Ion batteries are also in use aboard the A-380 and the new A-350 will have them too. So the real question of the B-787 is did Boeing push the technology envelope to far? We may not know the answer until technology catches up to the B-787, and only Boeing, FAA, EASA, and the subcontractors can solve that.